An in-depth look at varsity gunplay. University provides a fantastic opportunity for students with shared interests to connect through societies. Perhaps most enviable of all, it offers the time and flexibility to truly invest in a wealth of temptations: sports, media and, of course, video games. With its ever increasing popularity, It should come as no surprise then that esports would find it’s place too. As both player and spectator audiences grow, communities across the UK have developed to accommodate this new demand, with lecture theatres providing the perfect venues for League of Legends, Dota 2 and CS:GO viewing parties. As a postgraduate researcher, I may not have the same freedom as I did during my undergrad years, but when I heard that an esports society had been created at Southampton University, I leapt at the chance to engage with players beyond my online team. I’ve been playing CS for over ten years now, making it a not-insignificant part of my life. Despite my long relationship with the series, I’d never really considered dabbling into the realm of competition beyond a few IRC-organised pick up games in the days of Source. Following a brief internal league however, I found myself on the shortlist to compete in the National University Esports League (NUEL) for Southampton’s top team. Captained by Wildsam, and combining the might of Stubacca, Zack, Rennui and Ferno (myself), the 'Deadliners' were formed. Started back in 2010, NUEL was designed to support students with a passion for competitive gaming. Though initially focused on League of Legends, the game roster has recently been expanded to include Hearthstone and Counter-Strike. With the CS league relatively unknown, It wasn’t clear what level of competition we’d be facing. At the time of entering I held the rank of Legendary Eagle which, according to current estimations, put me in the top 10% of players. Now while that’s certainly something I’m proud of, it’s still a significant jump from the top 0.6% that comprise the Global Elite. If any universities were fielding players of that calibre, we’d certainly have our work cut out for us. Collected below are my experiences of each week of the league. I’ll take you through our successes and setbacks, both in game and out. As a newly-formed outfit, Deadliners’ experience should provide a reference for what players new to the amateur competitive scene can expect. I can’t guarantee your experience will match ours exactly, but hopefully you’ll find the inspiration to take the plunge yourself. The NUEL tournament consists of two stages. Teams play two best-of-one (BO1) games per week. The first two weeks are reserved for qualification. The top 16 teams enter a double elimination bracket in the subsequent weeks. The remaining teams are entered into the S-League and continue the BO1 format to compete for the highest possible position of 4th. Each week, the team dropped from the elimination bracket enters the top position in the S-League. Anxiety and anticipation. Excitement tempered by trepidation. In the hour running up to our first match my mind was racing. Why hadn’t we scheduled the time to practice beforehand? Who would our opponents be? What ranks should we expect? The degree to which a minor alteration to circumstance can change the entire weight of a match caught me by surprise. Though playing the same game as I would do any other evening, the added element of ceremony to a scheduled match brought a sense of unease I was wholly unused to. When it was revealed that we would be facing the previous winners of NUEL’s winter season, University of Manchester, it’s safe to say my aspirations for the match were stunted at best. Like most maps in CS:GO’s roster, Cache is generally considered to be CT-sided, that is to say the CT side is expected to win more rounds in each half. We were therefore grateful to open in the stronger position. However, while the map may favour CTs, we quickly discovered that our team did not. Unable to maintain control of the centre, adaptation proved difficult and the lack of experience together quickly became evident, costing round after round. I had offered to play as our team’s primary sniper, but with our economy in tatters I found myself barely capable of affording an AWP, let alone performing with it. Scraping together only a handful of rounds toward the end of the first half, prospects looked bleak. Fortunately, the half-time changeover provided a much-needed ease of tensions,finally allowing our team to relax into a pace that suited us. With a strong start, I was finally able to find my personal comfort zone, shifting location round-by-round to catch people off guard. Unexpectedly, we found the momentum shifting in our favour, finally allowing us to dictate the flow of play. When it finally came, victory was near euphoric. Had we really just managed that? If we could compete with the previous winners, how far could we expect to go? With our next opponents ready to play we had little time to celebrate, instead rolling straight into our second game and imminent demise. Where UoM had been precise, carefully timing peaks and flashes, Bath A were relentless. Piling onto sites in five-man pushes, the change in tempo blindsided us, overwhelming our shaken defence. Reeling from the high of a win, we suddenly found ourselves in the aftermath of a bloody loss. It looked like things wouldn’t be so simple after all, but if we could just claim one match in the following week, our chances of qualifying for the elimination bracket were still good. Sadly I was unable to compete during the second week, leaving my team to find a substitute. Even so, the knowledge that we needed just one victory to qualify for the knockout stage kept me pinned to my phone during the evening of the match. The news that finally filtered through was far from positive. Confusion and disagreements betrayed the result: we had lost both matches and were likely relegated to the S-League. Despite dropping to the lower league, I wasn’t yet ready to give up, and together with my team resolved to give the remaining matches our all. The opportunity to play in a more formal setting and develop as part of a new team had given a whole new drive to my time spent in CS. I had already begun to see clear improvements to both aim and positioning, earning me a regular top spot in my matchmaking team. The first week in S-League served as a polar introduction to NUEL’s broad range of skill. First lined up against OX Gaming from Hull, we found ourselves comfortably surpassing our opponents and eased into an almost-casual 16-5 victory. The relaxed attitude this fostered left us utterly unprepared for the 16-3 bruising we then received from Swansea Green. Competitors in the winter tournament, they showed such confidence and ease together that we were taken aback to see them outside the elimination bracket so early. It’s safe to say that we were thoroughly outclassed, but as tough as a heavy loss can be, there’s a level of benefit to competing against a higher class of player and no shortage of insight to be gleaned. Expecting to suffer some humiliating defeats, I had made a mental effort to take positive factors away from each match. At the very least, our execution had been swift. During the matches, we made a concerted effort to provide support toward each other beyond in-game actions. Our captain, Wildsam, was a constant voice of reassurance, never allowing the situation to shake him. Even while winning, it’s easy for a player to set themselves off-kilter after losing a number of duels in a row. Usually found topping the frag count, Stubacca lost a series of contests early in the first match and was vocally shaken. However, support from the rest of the team meant it wasn’t long before he was back on his feet. When playing as part of a team, it’s important to make sure you’re aware of your teammate’s mental state and give them encouragement when necessary. After all, everyone has bad days. Week four shall henceforth be known as the week of the food coma. There are some interesting lessons to be learned in competing around a fixed schedule, and one of those is to plan your dinner well. Much like physical sports, it’s a bad idea to consume a vast quantity of food, no matter how delicious, before playing CS:GO. While not suffering the same stomach issues as a game of basketball would provide, my body had instead decided that reaction times and logical reasoning were unimportant when compared to digestion. As a result my time spent in the first match against Sheffield Hallam was spent staggering blearily around the halls of Cache. Fortunately, where I proved lacklustre my team was more than ready to pick up the slack, each member earning over 20 kills to secure a second S-League win. In a fitting twist of fate, the second game lined us up against Portsmouth’s 5 Noobs Who Don’t Play CS. Southampton and Portsmouth hold a significant University rivalry, sparring off against one another in each year’s Varsity sporting competition. The prospect of a grudge match helped shake me out of my stupor, keen to uphold Southampton’s winning record against our rival. Contrary to their name, we knew that Portsmouth was fielding at least one player of Global rank, an intimidating prospect for a team of Eagles. Playing on Overpass, far from our comfort zone, the match was a tightly-fought contest. If not for a herculean 30-kill effort by Zack, the match would have gone Portsmouth’s way. Impressive individual performances can do a lot to boost morale in a tough match, providing a source of inspiration while easing some of the load for those struggling. However, repeated success can be a double-edged sword. If one member is seen to be consistently playing better than the others, it can lead weaker players to question their value to the team in general. It was therefore a pleasant surprise to find that our top scorer would shift every week, and often led the pack by only a small margin. That we had such similar skill levels was a surprising positive, allowing independent highs to shine without anyone feeling that they were falling behind. Unfortunately, this week also supplied its fair share of frustration, highlighting imperfections in the backend system for the league. Each week, match and server information was granted only within an hour of the scheduled time, causing some serious problems when the servers stop responding. After an exasperating 30 minutes of waiting and refreshing the NUEL site, we were all but ready to give up on playing when the information finally came through. Small failings like this are far from terminal, but marr the overall experience of an event, replacing anticipation with annoyance. They found us. I thought the land of structured competition would be free of trolls, but still they come. “HAHAHAHA” they cry “THE NEXT GeT_RiGhT?” Within minutes of joining the server, chat was flooded and before long nothing intelligible was left. Then I remembered that CS:GO has a mute function. It seems a sad truth that any competitive game will be marred by a sizable, unpleasant portion of the community. For every friend I’ve made through online matchmaking, I’ve had to wade through at least five vitriol-spewing antagonists. Combining a volatile mix of anonymity, young audiences and adrenaline-fueled competition, it’s all too easy for players to approach both allies and foes with a hostile attitude. The most depressing aspect is that derogatory remarks can even prove rewarding. The right comment at the wrong time can do a serious number on a player’s mental resolve. Placed in a tense environment requiring a great degree of finesse, it doesn’t take much to push most people over the edge, and the further you fall down the slippery slope of frustration, the more difficult it becomes to recover. That this kind of behaviour can be rewarding is infuriating to say the least, but to see it in a more serious competitive environment caught me off guard. You would hope that any team willing to commit to a weekly schedule would show some degree of maturity. Confrontational behaviour may sometimes provide immediate benefits, but it provides an unwelcome front for new players, and does little to progress the still developing realm of esports. 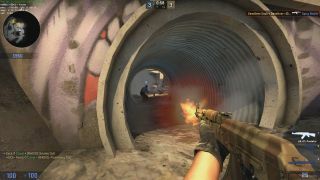 Most competitive games have begun taking steps to punish abusive behaviour, offering temporary bans or time in purgatory but CS:GO still has a long strides to make in this regard. I should count myself lucky then that not a single member of my team took this approach. Even on the receiving end of our worst beatings, we stayed respectful. This resulted in a far more amiable environment. To be fair to our opposition, UoL:A were far from directly offensive, simply filling the chat with endless, key-bound memes and lines. A brief check of the NUEL site informed that their team had in fact qualified for the elimination stage but fell out in the first round. Their team had even beaten Swansea Green, at whose hands we received a resolute 16-3 drubbing. It was in all probability that they had little interest in competing further, and after ending the first half 10-5 they all but collapsed. Likely hoping to be dropped from the remaining games, UoL:A even submitted an opposing match report following the game, contradicting our victory. The poor behaviour did little to sour our mood however, as four straight victories in S-League had put us within touching distance of a top ten finish. I’d love to say our NUEL experience ended on a high, conquering all odds to close our tournament run with a hard-earned win. I wouldn’t be far wrong, but it wasn’t quite to be. Following a loss to the capable but disrespectful Surrey Lions, we found ourselves pitted against Warwick CS in one of the closest games of the entire tournament. Our two sides went blow for blow against each other, trading rounds throughout the first half to end at 8-7. With a strong pistol round, Warwick forged ahead, carving a five-round lead to reach 9-14. In what was probably my personal best performance of the tournament, both AWPing and rifling, we held the line. Clawing back round after round we finally brought the scoreline level. Then, just as it felt we had gained the upper hand, we were broken. A sloppy attempt to push onto Overpass’ B bombsite left our team in disarray. Warwick took the final round without competition. We had lost 14-16. A win would likely have placed us around 10th out of a 60 team roster, and I found myself thinking back for days on how we could have changed the result. Due to conflicting schedules, our team had been forced to find a sub for Stubacca in the last hour before the match. While performing admirably, it was clear that our sub was a little out of their depth. If only we had the full team. If only we had pulled back on that last B approach. While I was devastated at the time, the better team deserved the win and I couldn’t have asked for a closer match to round out the league. Across the course of these twelve matches, each member of the team had gently gravitated into the roles that suited them best, and we found that we complemented each other well. Stubacca proved a competent solo player, more than capable of holding the B bombsite alone on maps that required it, while Rennui and Zack formed a stable rifling team to lock down control in a region. If I had to pick a weak point, it would regrettably have to be myself. Lacking in a dedicated AWPer, I had offered to play the role. Though I was more than capable of playing the aggressive T-side, I regularly struggled to hold the middle lane when defending. However, this trial by fire has since seen my sniping proficiency extensively honed, to the point where I can now comfortably say that the AWP is by far my best weapon. For a team of strangers, thrown together a matter of weeks before the league, I’m extremely proud of our performance. Over the course of a few weeks, we developed together on all fronts of our game, from coordination to moral support. It’s clear that the NUEL system is designed from the ground up for inclusion. While the elimination bracket is the main draw, the existence of the S-League gives new or inexperienced teams like our own the chance maintain a presence and vie with those of a similar capability. Competing in a league, even just at the bottom rung, gives a drive and energy to the game that can’t quite ever be replicated in standard online play. Since the start of the league I’ve been playing more CS:GO than ever before, even pushing myself into a higher skill group. Given the chance and time to practice, I would run it all again to aim for that elimination stage, and happily with the same team. The majority of Deadliners had entered the league unacquainted, but I wouldn’t hesitate to invite any of them for a game in the future. This championship marks only the second NUEL foray into CS, and the back-end side is still showing some clear teething issues. With match information given only briefly before the start time, it’s no surprise that server problems could lead to frustration. Re-use of a limited server pool once led to players for the following match joining the server for our still-ongoing game. There’s also no clear way of checking the standings of either the elimination bracket of S-League on the NUEL site. Weekly fixtures list matchups and winners, but only within a group of five teams. To this day I still haven’t been informed what place we finished. In truth, NUEL is a far cry from the bigger online leagues like FACEIT, but it doesn’t really have to be. A large part of appealing to the student demographic is to encourage new communities and talent countrywide. With the backup of an S-league for drop-outs, NUEL gives newcomers a place to test the waters of competition before they dive into its murky depths. Would I recommend NUEL? If you’re a university student and interested in CS, certainly. If nothing else, I can think of no better excuse to find a team and get practicing. If any the above sounded like your cup of tea, the current NUEL season has just ended, leaving plenty of time to practice for the next. If you’re not a student (or not based in the UK) there’s no need to worry as plenty of alternatives are out there: the Electronic Sports League (ESL) run an open league at no cost of entry, while FACEIT takes online matchmaking to the next level, scheduling games against other teams and running regular competitions for prizes.